Two CPUT fashion design students have scored the opportunity of a lifetime. 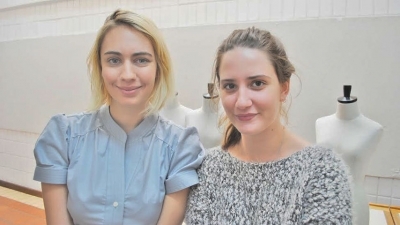 Third year students Kelli Botha and Caela Viviers won the top prize in a project collaboration between CPUT, Woolworths woman’s wear division and Kingston University in London. The prize saw them intern at Woolworths as well as travel to the UK for a week, visiting Kingston University and attending the London Graduate Fashion Week where more than 200 institutions showcase their best student collections. Kelli and Caela’s work went on display in the Waterfront Woolworths window last week and this week it is the turn of two winners from Kingston University. 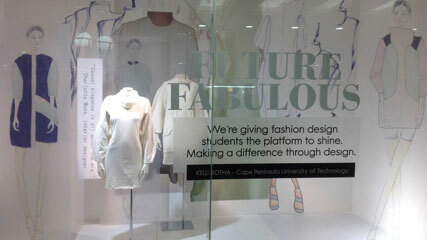 The whimsical display featured the designs, rough sketches and toiles (sample garments) of both students. “It was amazing to see our work in the Woolworths window… we think they did a wonderful job with the layout and display- it really looked great,” says Caela. Both young designers are busy completing their graduate collections at the moment and say the once-in-a-lifetime experience has improved the quality of their work infinitely. The Woolworths, CPUT and Kingston project has been managed by Annadine Vlok and Maryna Bergh both Fashion Design lecturers. Bergh has also done exchange lecturing at Kingston University as part of the project, for the last three years.